Yes, you are reading correct. Now You can run any Windows 8 Apps on the desktop of your Windows 8 Computer. Stardock, the developer known for many Windows Desktop Enhancement software. Now they come up with new Windows 8 software called “ModernMix”. By using this Modern Mix software Windows 8 users can run modern Apps( Metro Apps (or Windows Store apps)) in your Windows desktop. 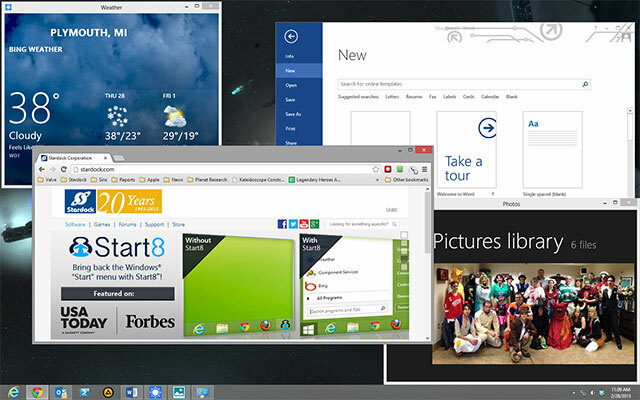 Microsoft’s introduced many features such as Start screen, Metro Apps in their new Modern OS Windows 8. But Many Windows Users don’t like this start screen and they search for the best alternative for Windows 8 Start screen . And, also many Windows 8 users ( including me, at first ) have frustrated when using Windows Metro Apps. Why many users have complaints about this? Because,Windows Metro apps can only run in full screen. As a result, that weather app, the mail program or stock ticker is going to use the entirety of your computer display. Windows 8 user can’t change the Windows size, and there are no Close, Minimize and Restore button. You can’t run many apps on the same screen. Like this. Now ModernMix have given help hand for those frustrated Windows 8 users. Just head to the Download link and go to the download page. There enter your email address and open the download link in your Inbox. Using this ModernMix Application, Windows 8 users can run multiple Modern apps in the desktop. Also, You can launch modern Windows 8 Apps from Desktop. You can change the window size of the Windows 8 app in desktop. After that, Whenever you launch that particular App, it will open with same window size. Like the Desktop Applications, You can pin the Windows 8 Metro Apps in the taskbar for quick launch. The Windows 8 App in desktop mode will have the regular title bar and close button. It provides “F10” Hotkey to easily switch between full screen and windowed mode. This program is not free, only costs you $4.99 after 30 days trial period. Still you can download the fully functional beta version of this Program for free. Want more free software products like this Read our 100+ Best Free Windows Software Programs Ever (Security,Media,Utilities….) post.